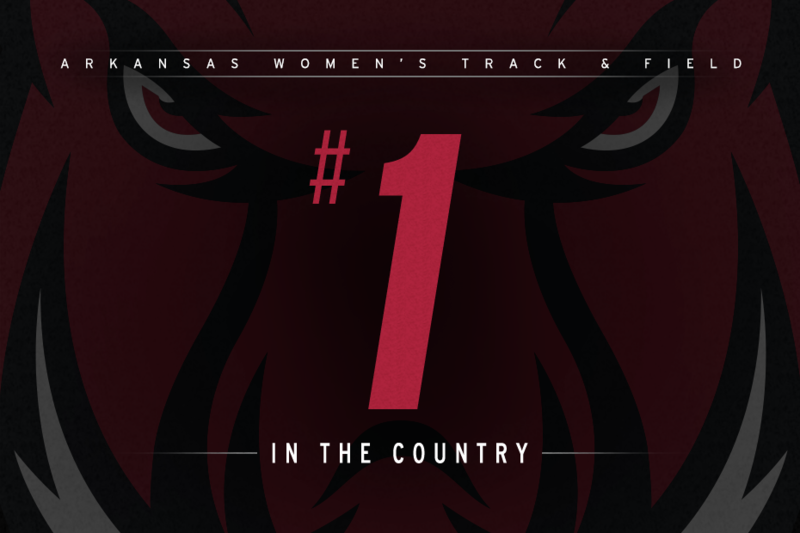 NEW ORLEANS – Fresh off its second-place finish at the national indoor meet, the Arkansas women’s track and field team will open the outdoor campaign as the preseason No. 1 team as the USTFCCCA’s poll released Monday evening. The Razorbacks claimed the top spot in the preseason poll for the first time in program history. The Razorbacks lead the way with 289.37 points and rank ahead of the defending national champion Oregon. Arkansas finished sixth in last year’s national outdoor meet, but return a plethora of talent and are looking for improvement this season. The Razorbacks return 12 qualifiers from last year’s national meet that competed in a total of seven events. Reigning indoor national champion Lexi Jacobus, and runner-up Tori Hoggard, will return to the field after finishing second and sixth, respectively at last year’s NCAA meet in Eugene, Oregon. Now a three-time national champion, Jacobus was named to The Bowerman Watch List following her indoor performance that saw her set a program record clearing 4.66m/15-3 1/2 that was also good for No. 2 in NCAA history. Fresh off of her indoor pentathlon national title, senior Taliyah Brooks returns to the heptathlon looking to improve on her bronze-medal performance from last season’s national meet. Brooks closed out last season with an Southeastern Conference title in the event, posting a program record score of 6,099 points and then went on to set a program record in the long jump with a distance of 21-4. Sophomore Taylor Werner and senior Nikki Hiltz will lead the charge for the distance crew this season. Hiltz, who has finished second in the 1,500 meters at last year’s national outdoor meet and third in this year’s national indoor meet mile, will continue her search for her first individual title. Werner will return to the track hoping to qualify in the 1,500 and 5,000 meters this season. The Razorbacks are looking for their 13th-consecutive conference title, and fourth-straight SEC triple crown, this spring after cruising to another indoor league title this past winter. Arkansas will face a loaded conference field that includes eight additional top-25 conference programs. The national team rankings are compiled by mathematical formula based on national descending order lists. The purpose and methodology of the rankings is to create an index that showcases the teams that have the best potential of achieving the top spots in the national team race. Rankings points do not equate with NCAA Championships team points. Preseason rankings will include marks from 2017, and the National Team Computer Rankings will continue to do so through the third regular-season edition. The Razorbacks will make their outdoor debut at the Arkansas Spring Invitational in Fayetteville, Arkansas, on March 23-24 at John McDonnell Field. For more information on Arkansas track and field, including in-meet updates, follow @RazorbackTF on Twitter.